Goldeneye sits on a bluff facing the blue Caribbean Sea, offering a dramatic coastline of secret coves and private beaches for you to explore and enjoy. Ocho Rios is about 25 minutes away from Bolt House. It is also midway between Montego Bay (67 miles West) and Port Antonio (67 miles East). It is 60 miles North of Kingston. Ocho Rios is 1.5 - 2 hours from every major town in Jamaica and borders five of the islands parishes. Uptown Golf Course - at the Sandals Golf & Country Cub. Chukka Cove - offering an original Horseback Ride ‘n’ Swim tour at Chukka Cove Farm, plus everything from polo to trail rides. They also offer mountain bike tours and river tubing. Dunn's River Falls - Dunn's River Falls is one of Jamaica's national treasures. Enjoy a guided climb up the world-famous falls. Dolphin Cove - Swim with Dolphins, Swim with the Sharks, Interact with Stingrays (Barbs removed) at Dolphin Cove in Treasure Reef. Captain you own Mini-Boat or go Glass Bottom Kayaking on the Caribbean Ocean, enjoy a splash in the turquoise ocean or relax on the pearl white beach. Mystic Mountain - Jamaica’s newest tourist attraction, is the hottest new destination in Ocho Rios, Jamaica. Rainforest Bobsled Jamaica at Mystic Mountain boasts over 100 acres of land stretching from the coast road entrance near Dunn’s River Falls to over 700 feet above sea level at the peak of Mystic Mountain. Firefly - Exquisite home of songwriter and international celebrity Noel Coward. The Government of Jamaica has deemed it a national monument and organized an informative exhibition depicting Sir Noel's career. Before, during or after your tour, take in the remarkable vista from Firefly's cafe bar-here you can partake of refreshing mixed drinks, a glass of wine or afternoon tea. There is also a light lunch menu available. Coyaba River Garden and Museum - Coyaba Gardens features beautiful genuine water garden, fed by streams that rise on the property. Exquisite Jamaican Spanish architecture, spectacular Mahoe waterfalls and a Museum of Island History focusing on the forgotten Taino/Arawak culture of Jamaicas first inhabitants. Cranbrook Gardens - Cranbrook Flower Forest is a unique eco-tourism attraction located on Jamaica's north coast at Laughlands in the parish of St. Ann between the two main tourism and cruise ship towns of Ohio Rios and Montego Bay. Shaw Park Gardens - Experience the natural pristine beauty of Jamaica's Shaw Park Botanical Gardens and Waterfalls. 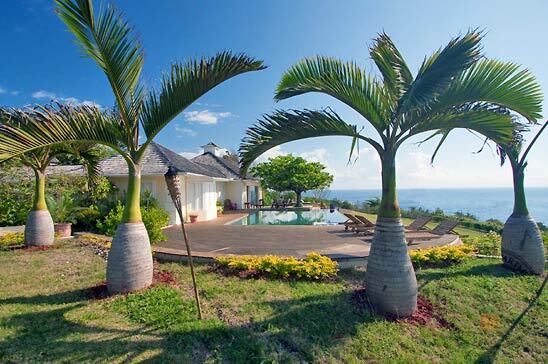 Situated high on a hilltop overlooking the azure waters of the Caribbean Sea, the Gardens embrace 25 acres of tropical splendour. Walkerswood Jerk Tour - This guided tour is of special interest to anyone who would like to learn more about Jamaican foods or would just like to see the countryside outside Ocho Rios. Walkerswoodproduces popular jerk sauces, jams, pepper sauces, and more; this one-hour guided tour takes a look at the factory as well as the site's herb gardens, a recreated countrystyle home, and even includes a demonstration on making jerk marinade. hand-woven straw hats, bags and purses, jewelry, t-shirts, Blue Mountain coffee. Island Village - Jamaica's first theme park comprising a wide range of entertainment and retail options on the Ocho Rios waterfront adjacent to the Cruise Ship Pier. Goldeneye - Goldeneye serves traditional Jamaican cuisine, which is a melding of cultures and influences. Menus are created using market fresh seasonal fruits and vegetables. Fresh fish and lobster are purchased daily from local fishermen. Janga or freshwater crayfish are caught in nearby rivers. Our Jerk chicken and pork are an island classic. Reservations need to be made 24 hours in advance. Tuscanini – Near to Ocho Rios, at Harmony Hall, there is a famous Italian restaurant which is called Toscanini form the name of an Italian musician. The owners are Mirella Ricci and Pierluigi Ricci, the chef which in 1999 was winning the prize as best new chef in Jamaica. Passage To India - Passage to India is the brainchild of Anil & Rajni Sud and Rajiv Bhatnagar who each have respectively more than 20 years of hospitality experience behind them. Evitas - Enjoy fine dining in Ocho Rios, Jamaica in the setting of an authentic 1860's Gingerbread house with wooden floors and mahogany bar. Evitas specializes in Northern Italian food, also has an extensive selection of creative Jam-Italian fusion dishes of fresh pasta, seafood, vegetarian, and meat entrees.